This seminar gets right down to business. It's a "here's what to do - and the best way to do it" crash course for new team leaders. We designed this seminar with input from veteran team leaders at organizations across the country. You'll explore the issues they believed were most critical in their own team development. Their input was just what we hoped for: refreshingly honest. Revealing. Insightful. Even surprising at times. You get a program packed with the leadership training and insights you'll need to guide your team through its infancy to full maturity as an effective work unit. 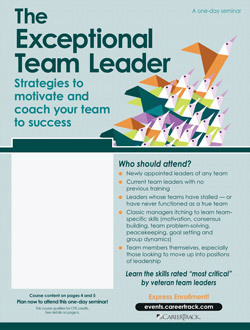 No matter what kind of team you lead, plan now to attend this course. You'll learn how to get the most out of your people — and discover what they expect from you in return. Will you benefit from attending this course? No matter what kind of team you lead, plan now to attend this course. You’ll learn how to get the most out of your people — and discover what they expect from you in return. Use performance challenges to build team loyalty and genuine "esprit de corps"